Also known as the cape jasmine, gardenias are a popular plant in the South. An evergreen flowering bush with white fragrant blossoms, depending upon the type, these plants will grow from 2 to 8 feet wide and tall. The creamy white flowers bloom throughout the summer and fall, giving off a beautiful fragrance. Like other flowering shrubs, gardenias require proper planting, watering and fertilizing to thrive. Select the site for the gardenia. They do well in partial to light shade with soil that is moist, rich and well-draining. An acid-loving plant, gardenias need a pH between 5.0 and 6.0. Prepare the site for the gardenias. Test the soil a month before planting and amend it using hydrated lime or sulfur. Several weeks before planting, dig up the soil, remove weeds and rocks and incorporate generous amounts of compost or well-rotted manure and peat moss. Plant the gardenia in the spring or fall. Dig a hole that is as deep as the root ball and two to three times its width. Fill the hole with water and set the gardenia in it. Add the soil to the water, until the hole is filled and the soil firm. 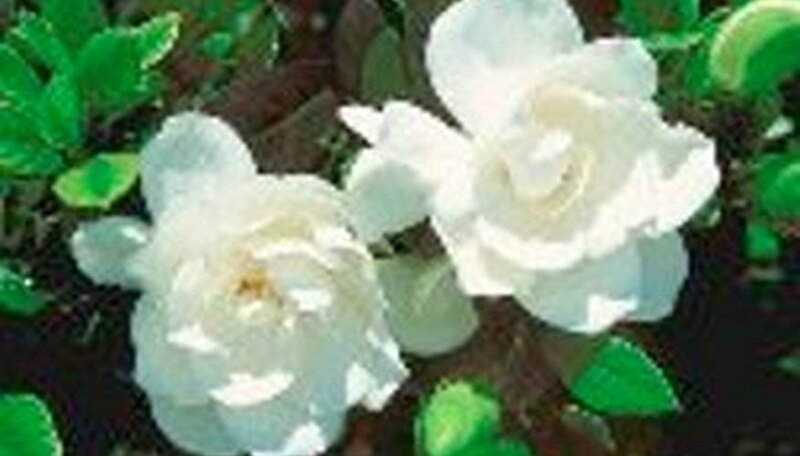 Water the gardenia regularly, keeping the soil moist but not soggy. Direct the water towards the roots; avoid getting the leaves wet, which can cause fungus. A 2-inch layer of mulch will help retain the soil’s moisture and enrich the soil. Feed the gardenia with an acidic fertilizer about once a month. If you have access to pine needles, which increase the acidity of the soil, spread them underneath the gardenias. To prevent the pine needles from washing away during rain, cover them with mulch. Treat white flies or mealy bugs with an insecticidal soap or horticulture oil. Remove any leaves that turn yellow or spotted. Prune the gardenias in early spring to control the shape of the plant. Deadhead--or remove--the spent blossoms to encourage additional flowering. Winterize the gardenia before the first frost. Rake pine needles or decaying leaves around the base of the bush.